This thread is simple! Rather than having a million little threads about everything that goes on at Hard Rock/Freestyle Music Park , this thread is designed to consolidate it all into one user-friendly thread. Feel free to use it to post updates, trip reports, questions, comments, and of course, general discussion. For pictures and videos of the park as well as past updates, see TPR's Park Index Page. April 9th, 2007 - Rides announced for Hard Rock park opening in 2008 - SEE BELOW! March 17th, 2008 - "Midnight Rider" renamed "Life in The Fast Lane"
May 4th, 2009 - transformation of "Led Zeppelin: The Ride" to "Time Machine" announced. July 9th, 2009 - Park drops entry price significantly to draw crowds. February 13th, 2012 - Waccamaw Pottery outlets has a new owner! June 28th, 2013 - Hard Rock Park planned to release a park soundtrack! Two roller coasters - one jamming to '80s tunes, another blasting Southern rock - a cafe reminiscent of the '60s and a Jamaican-themed water play area are among the attractions that will fill the Hard Rock Park. Six zones will cater to music fans' different tastes, from country to British rock. A heavy-metal comedy act dubbed "Roadies Stunt Show" will feature acrobatics and pyrotechnics. The 140-acre park's developers, working on the park's financing and plan for more than four years, unveiled the details Monday, kicking off a six-city promotional tour at the Hard Rock Cafe in New York City. Each stop will net a piece of Hard Rock memorabilia to go in the park, including a graffiti-covered wall from the notorious CBGB rock club in New York City, which closed last year, and a white studded cape owned and worn on stage by Elvis Presley. The park is scheduled to open in April 2008. Tickets will sell for $46. "We've been dreaming up Hard Rock Park for the last few years and we can't wait to start showing people what they can expect to experience," I am too stupid to spell Steel Vengeance so I'll just write SteVen and pretend I'm being cool Goodwin, the park's CEO, said in a news release Monday morning. "From the innovative technology to develop the rides and the entertainment experience to the truly priceless memorabilia we will have on display and special events we will host, visitors can expect a new standard of fun to rock fans of all ages." # Midnight Rider | A Southern Rock roller coaster that careens through a creepy abandoned lumber mill. # Reggae River Falls | A Jamaican-themed water play area. # Mainstreet Gas & Gifts | An old gas station converted to a surf shop where antique glass gas pumps become kid- powered whirlpools. Now that details have been released, officials are hitting the road in their most high- profile piece of memorabilia, the Beatles Magical Mystery Tour Bus, to promote the park. The bus will hit the Hard Rock Cafes in six cities, starting in New York today, then return to Myrtle Beach on April 18 for the opening of a preview center. The center, on the park site in Fantasy Harbour off U.S. 501, will give people a glimpse at what the park will look like. This park is sounding awesomer by the minute. Would have been nice to know which ride will become the B&M, but the attractions sound like good ideas to an already great park! I just hope that it opens on time in 2008. Last edited by jedimaster1227 on Thu Jan 17, 2019 7:23 am. "Hard Rock" isn't just about rock music. I would think they would have Metallica or Jimmy Hendrix fans sing some of their songs in a cool karaoke type concert. Other than that buy Rock 'N' Roller Coaster from WDW and place it there. Vekoma SLC and a Boomerang anyone? I think it's the "Maximum RPM" coaster in the background; if that's actually the layout it doesn't look too bad! I think that might be some old concept art which may or may not relevant to what's actually going to to go up. It sounds like the B&M is going to be kind of like Hollywood Dream at Universal Japan. Whatever it turns out to be, I know where I'll be headed to in '08! I live across the street from the park and I have seen what the park is suppose to look like. All i saw was a photo copy of the blue print but the roller coaster footprint looks identical to the ride pictured in that preview picture. Most of the buildings in the concept art look similar to the buildings that are in construction right now. You can also see coaster markings in that area and it looks pretty legit. I am needless to say very excited about the park, but let me tell you that traffic will be terrible there until they finish the bridge that they are just starting construction on. Its already bad enough. I agree, they really need to get the traffic situation figured out fast before they have a bigger problem on their hands... either way, people are going to show up in droves when it opens, but if they want people to keep coming back, they need to figure it out, quickly. I know I can't wait to head down there once it opens! 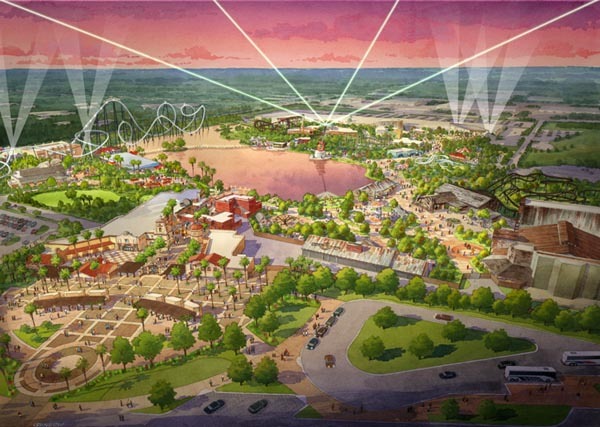 Sounds like it is gonna be a great park to visit!